Present an image of reliability and quality to your current or prospective patients with beautifully-designed medical brochures, postcards, pocket folders or catalogs. If you are a supplier of medical technology, medical imaging, health care services or have business-to-business clients in the medical field, choose Direct Axis to make your communications noticeable. We specialize in medical brochure design and production of print and web media for the healthcare industry. Take a look at medical brochure design samples we’ve created for our clients. Email or call us today, toll-free for a quote on your project. Need a website for your medical business? We created a series of brochures for SynerMed. Each participating doctor was provided with an individualized brochure for their practice. Inform patients and caregivers about your medical facility and capabilities. The brochures shown left, were designed for a healthcare insurance provider. Businesses in health care hire us to create capabilities brochures with graphic design that impresses and attracts new clients. This medical brochure was used to describe imaging equipment offerings for hospitals. The brochure is hand-delivered by sales representatives, sent via direct mail and given out at trade shows. 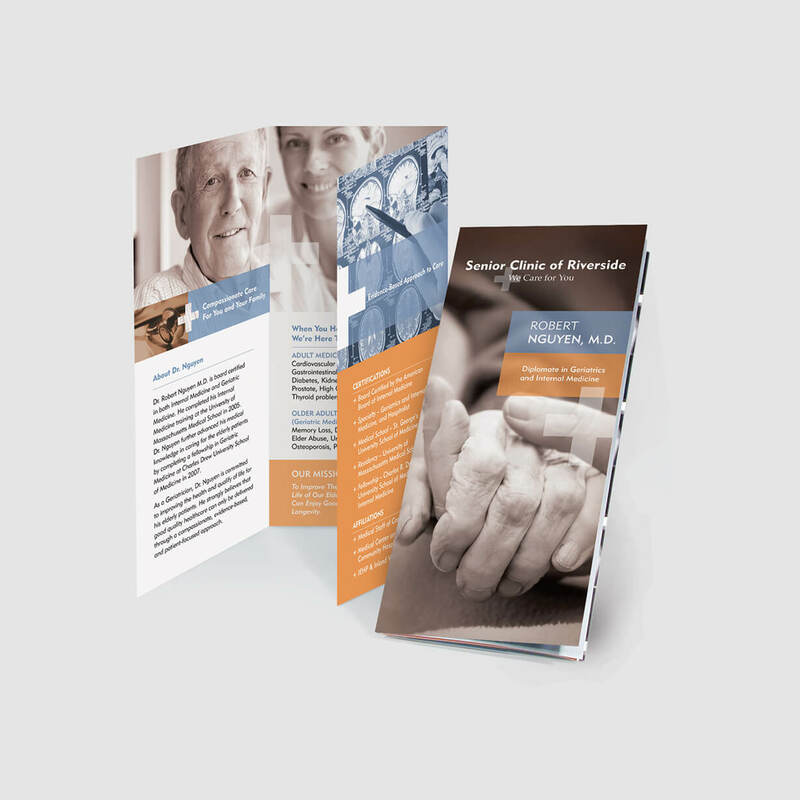 A consortium of 6 health care companies, TTG engaged our services to create the medical brochure design shown. The brochure describes the corporate structure and covers their diagnostic, equipment, nuclear medicine and other health care businesses. The catalog sample shown left was designed using Philips’ brand standards. Our graphic designers can follow your brand guidelines or create a unique new design for your catalogs. We create posters, billboards and pocket folders. Shown left is an example of a Pocket Folder we created for a home health care agency. We created this brochure to blend the seriousness of the subject with the desire to allow children to be children. The brochure’s message to parents is nurturing and caring while giving opportunity for happiness. A very happy and fun looking brochure design was used for a dentist’s office. We designed the pediatrics brochure above to attract families who need nursing services for their children. This retro-look brochure design was created for a Human Resources Department in a medical firm. The brochure included cash incentives for employees to help recruit qualified candidates.